Ever since Gruner Veltliner has begun to charm the palates of the world’s oenophiles, so has the interest in Gruner’s blue sister, Blaufränkisch, grown and evolved. It was as if this dark beauty was waiting, like the Sleeping Beauty, to be splashed with a kiss from handsome Gruner, and thus awaken to astonish her admirers with her own haunting loveliness. Blaufränkisch, as it is known in its native Austria, is a red wine grape that is grown across Central Europe and historically it has enjoyed a long history in this part of the world. In the days of Charles the Great (742 – 814 AD) the word ‘frankish’ was often attached to grapes that were perceived as superior and produced the best quality wine. Since ‘Blau’ means ‘blue’ in Germanic languages, Blaufränkisch can therefore be translated to mean ‘blue grapes of the Franks’. According to legend, Blaufränkisch vines were first introduced into Austria in the 10th Century, and the first official documentation of the variety was made in the 18th Century. The wine was reputedly one of the favourite choices of Napoleon and Bismarck. It is also grown in significant amounts in Germany and Hungary, and in smaller amounts in the Czech Republic, Slovakia and Slovenia. The high regard in which this grape is held in Eastern Europe has led to it being described as “the Pinot Noir of the East”. According to British wine journalist Jancis Robinson, the variety’s popularity and extensive acreage denote it as “the quintessential middle-European red winegrape”. 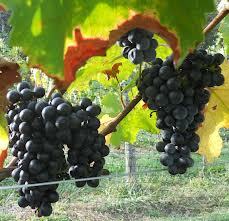 In Germany, the grape is known as Lemberger or, alternately, Blauer Limberger. The name Lemberger derives from the fact that in the 19th Century the grape was imported into Germany from Lemberg in Lower Styra, in present-day Slovenia, which was once part of the Austro-Hungarian Empire. The German climate is generally too cool for this late ripening variety other than in the southern province of Württenberg, where at present there are approximately 1200ha of Lemberger under-vine. In Hungary, the grape is known as Kékfrankos where it forms part of the famous ‘Bull’s Blood’ blend, but it is also bottled as a single varietal. The best examples tend to derive from the area around Sopron, close to the Austrian border. The grape is also grown in Washington State in the US, where it is known as Lemberger, and has developed a loyal following among the locals. One reason for finding this variety here is its ability to survive the harsh winters that can be a feature of the region. It is in Austria, however, where Blaufränkisch enjoys its highest status and finds its truest expression. Blaufränkisch is grown extensively in the state of Burgenland which lies in the eastern corner of the country, adjacent to the Hungarian border. Having recently toured Burgenland, I can confirm the huge dominance that this variety commands in the region, where nearly one out of every two vines in the 3000ha of vineyard is planted to Blaufränkisch. In this region the climatic conditions are considered to be warm due to the moderating influences of the nearby Neusiedlersee lake and the warm winds from the east. The climate is characterised by a cold winter with little snow, a hot, dry summer and a long, mild autumn. DNA analysis has shown that one of the parents of Blaufränkisch is a lesser-known variety called Heunisch, whereas the other parent is unknown. Blaufränkisch itself parented a successful variety in 1922, when it was crossed with St. Laurent to produce the Austrian red variety called Zweigelt. In Austria, the most acclaimed examples of Bläufrankisch tend to come from the sub-region of Mittelburgenland, clustered around the villages of Deutschkreutz, Lutzmannsburg and Neckenmarkt, as well as from the area surrounding the historic village of Rust on the Neusiedlersee. Vignerons growing Blaufränkisch in modern-day Austria tend to pay considerable attention to maintaining excellent canopy management and producing low yields. The end result is wines that have achieved great acclaim both in their native country and in the international arena. The barrique-aged Blaufränkisch wines are medium to full-bodied with great natural acidity and a generous but gentle tannin structure. The fruit flavours tend to be in the range of blueberries, red cherries, spices, liquorice and raspberries. The sound colour, tannins and raciness of the grape encourage the most ambitious Austrian producers to lavish new oak on it and to treat it like Syrah. Since Austria has much warmer and sunnier summers than Germany, the result is wine with much higher natural alcohol levels, accentuated by Austria’s decidedly lower average yields in the vineyard. While many Austrian producers in Burgenland prefer to use Blaufränkisch as a single varietal, others choose to blend it with other local popular varietals, such as Zweigelt and Cabernet Sauvignon. As far as I am aware, Hahndorf Hill Winery in the Adelaide Hills is currently the only producer of this variety in Australia, although other plantings have taken place in Victoria and Tasmania. We inherited the Blaufrankisch vines when we purchased the property in 2002. The vines were originally planted over 20 years ago by the previous owner, who was originally from Württenberg in Germany, and who was delighted to be able to source some Blaufrankisch plant material from within Australia. Unfortunately, we have been unable to establish any clonal details or any information about the rootstock upon which it was grafted. The material is virus infested which results in an extravagant display of orange and red hues in autumn. Fortunately, the colour change of the leaves only occurs after harvest and, therefore, does not in any way impact on the plant’s ability to ripen the berries. In fact, before propagating a new block of Blaufrankisch, we were on the verge of arranging for some material to be ‘cleaned’ of this virus when we were paid a visit from a German professor of viticulture who had a special interest in the variety. He had tracked us down as the only producer in Australia and was keen to see how the vines were performing. One of the first questions he asked was whether we had the ‘red-leafed’ virus infested clone or the ‘green-leafed’ virus-free clone. He then explained that he believed the virus-infested Blaufrankisch produced a much better quality wine because of the additional flavour nuances and the natural control of the yields. 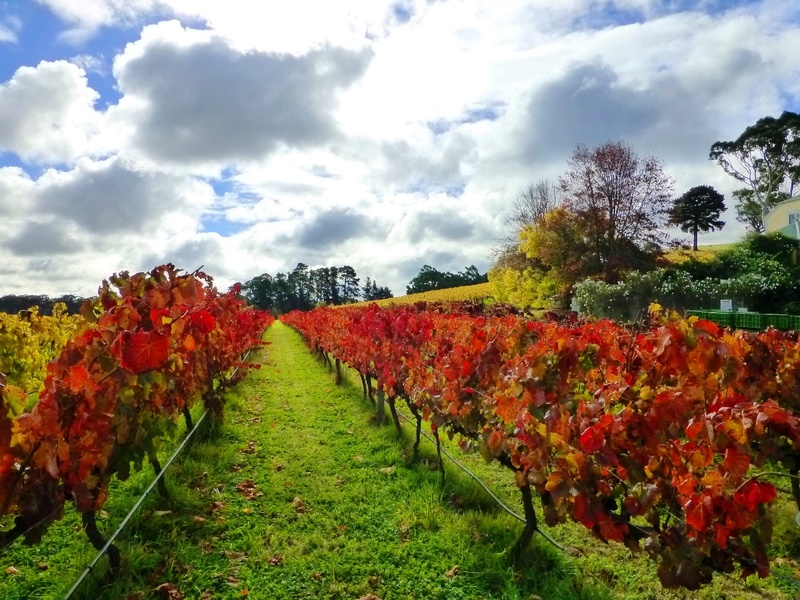 So the end result is that our new block of Blaufrankisch has retained its wonderful autumnal hues! In 2013 I imported two further clones of Blaufrankisch – one from Davis in USA and the other from Austria. We will be working with these new clones once they are released from quarantine. Blaufrankisch tends to be naturally vigorous and needs to have its yields controlled by strict and conscientious pruning. 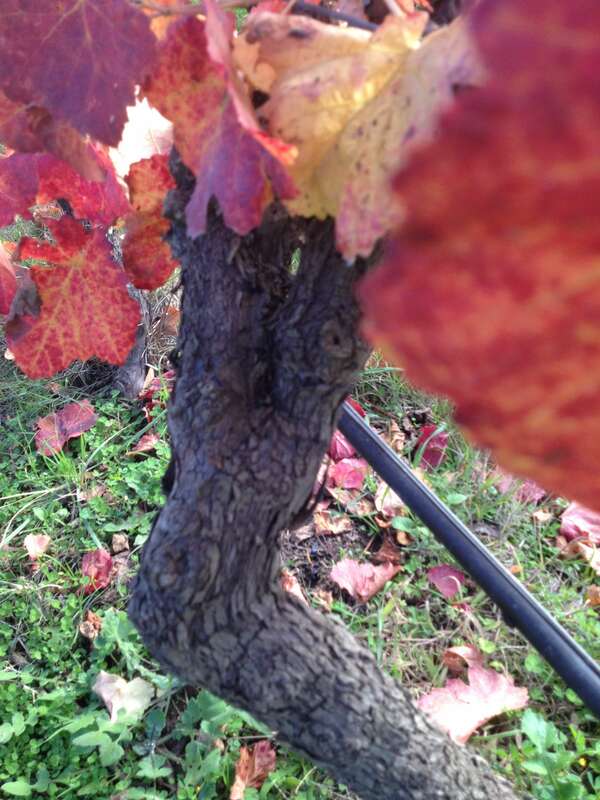 It buds early – about the same time as Chardonnay – but ripens late. As with Chardonnay, the flower clusters appear early and these blossoms are very sensitive and susceptible to coulure. For the past few years, we have harvested our Blaufrankisch in mid to late April, usually before our Shiraz. It is important, I feel, to note that although this variety is classified as a cool-climate red, it requires a specific type of ‘cool-climateness’ – one that is defined by ripening days that have significant diurnal variation. In other words, it needs solidly warm to hot days balanced by significantly cool nights. Without the warm days, I suspect, this variety could produce wines that lack its typical appealing plushness and gentle richness. Canes – The vine has very neat, rigid, upright canes which work perfectly with our VSP system. This characteristic aids canopy management, but does show an increased susceptibility to storm breakage. Leaves – The leaves are large and handsome with few lobes and teeth and the leaf plate is smooth, showing a deep green colour. The leaf petioles are thick and long. This causes them to break easily which is a significant advantage of canopy management. I have found the leaves to be fairly susceptible to powdery mildew. Berries and bunches – The berries are relatively large and loose, giving the bunch the form of a long, distended triangle. The thick berry skin provides good colour and densely layered tannins, and also allows the fruit to withstand the pressure from botrytis longer than other varieties. Each bearing cane will generally have two bunches – one rather large bunch and a second smaller one. In very hot years with high sugar concentrations, the Blaufrankisch berries tend to shrivel slightly without becoming raisins. The grapes have thick and long stems that become wooden fairly easily. For this reason, bunch stem necrosis occurs infrequently. Soils – Although Blaufrankisch has been shown to grow in most soil types, the typical fruit and deep colour of this variety are best expressed when grown in slate, loam or chalky loam soils. I suspect that this variety, if planted in the appropriate terroir in Australia, could be coaxed into producing wines of great elegance and suppleness. Blaufrankisch makes a great food wine that is tailor-made for Australia’s vibrant food culture. It is a superb addition to any table and works especially well with duck, venison, lamb, rare beef – and my personal favorite is rare-ish pan-grilled salmon! Since the Adelaide Hills – like Burgenland – enjoys warm summers with extended, slow ripening into cool autumns, I have confidence that the region can produce an exciting New World style of this varietal. The Hahndorf Hill ‘Blueblood’ Blaufrankisch has indeed achieved numerous awards over the past few years, including multiple trophies and gold medals at both national and international wine competitions. The latest gold medal awarded to the Hahndorf Hill Blaufrankisch was at the Berliner Wein Trophy 2015 in Germany. If the Austrian wine industry is anything to go by, Blaufrankisch has a terrific future. It is currently enjoying a golden renaissance with a buoyant local market and positively-surging export markets. Much of this success rests with Austria’s indigenous white grape, the fresh and trendy Gruner Veltliner. At Hahndorf Hill Winery, we imported three clones of Gruner Veltliner from Austria in 2006 which passed through quarantine and which were planted at our Hahndorf Hill vineyard. A further three clones of Gruner were also imported in 2009 and these were also planted in our new Gruner vineyard. In addition to Blaufrankisch and Gruner Veltliner, Hahndorf Hill is also the first producer of Zweigelt in Australia and we have also imported cuttings of St Laurent, another Austrian beauty. It does therefore seem that Hahndorf Hill has steadily evolved over the past few years to become a small representative of Austrian grape varieties in the southern hemisphere. In reality, it gives us great pleasure to develop, grow and dance with these beautiful natives from the north! The content of this article was originally written by Larry Jacobs and published in the Wine Industry Journal > VoL 24 no. 5 > September /October 2009, and has been updated. This entry was posted in Adelaide Hills, Adelaide Hills Gruner Veltliner, Adelaide Hills wine, Adelaide Hills wine region, Blaufrankisch, cool climate wine, Diurnal variation temperature, Gruner Veltliner, Gruner Veltliner Australia, Hahndorf, St Laurent, wine, Zweigelt, Zweigelt Australia and tagged Adelaide Hills, Adelaide Hills wine, Blaufrankisch, cool climate wines, Gru, Gruner Veltliner, Hahndorf Hill Gruner Veltliner, harvest, New Planting, Zweigelt, Zweigelt Australia. Bookmark the permalink.